« Catholics and Protestants, Israel, Human Sexuality debate, The End Times….. Standing together. On what basis? With all that has separated the Body of Christ over hundreds of years there is a mountain of disunity that we need to deal with. 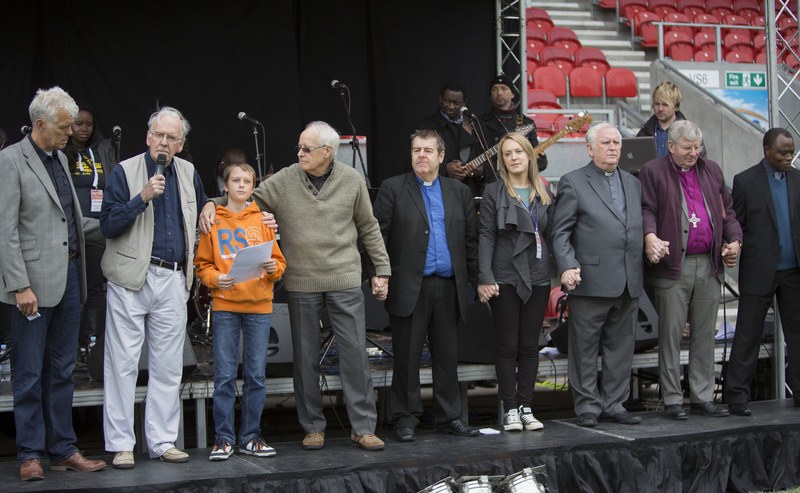 At Saints in the Stadium thousands of Christians from all traditions and backgrounds came together to call on God to seek His help for the United Kingdom. Eight people from different denominations of the Church stood and prayed for Oneness in the Body in the United Kingdom. There is only one God and Father. Centuries of separateness amongst believers for countless reasons does not change the unity of God. Standing together and singing or praying does not change the separation in our hearts. Issues of truth do not become flexible with us simply holding hands. We can, however, take heart from the increasing number of leaders and church representatives who want to see a change and want to stand together on the basis that Jesus is Lord. We prayed for God’s help in the matter of heart oneness. God is answering this prayer. This entry was posted on December 31, 2013 at 11:40 am and is filed under Christian Truth, Life. You can follow any responses to this entry through the RSS 2.0 feed. You can leave a response, or trackback from your own site.